Every year it's hits December time and I go through the DVD collection to find those few Christmas themed movies that I love to watch every year. I've done this with my sister for a few years running now and it's become a kind of tradition. I love Christmas movies because they are ALWAYS fun, family friendly, festive and fabulous. They always make it feel like Christmas and they always make me want to dress up in tinsel and wear red & green & dance around the house singing Christmas carols. 1. 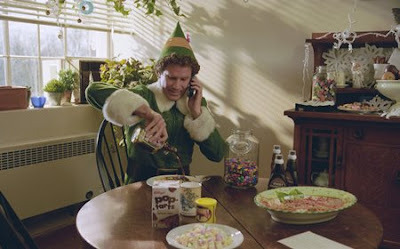 Elf (2003) - It's a must! Buddy the Elf is the epitome of all that is Christmas and if he can't get you out of the holiday blues and into the Christmas spirit then you're a lost cause :) He's innocent, adorable, loving, full of Christmas spirit and a complete JOY! 2. Bad Santa (2003) - Not your traditional Christmas movie I know, but Billy Bob Thorton is classic as the alcoholic conman who poses as Santa so that he can rob department stores. It's crass, it's crude but it is also fantastic. 3. All I Want For Christmas (1991) - The story of 2 young kids who try and get their parents back together for the holidays is my little piece of nostalgia. I can remember watching this movie on TV when I was little and when I found it on DVD a few years ago I was so excited - I was even more excited that it was in a sale bin for $5.00! 4. Fred Claus (2007) - This movie was the last movie I saw before I left London last year. I was sick, tired, wanting to be home and it lifted my mood. It's a funny take on sibling rivalry as we watch Santa's bitter brother Fred try to survive Christmas. It also start Vince Vaughn who brings that perfect level of sarcastic bitterness to a character who could have been 2D. I know there are a lot of Christmas movies to choose from but those are the ones I watch to make me feel a little more in the Christmas spirit. Other Christmas movies I love but aren't as essential - I'll Be Home For Christmas (1998), The Santa Clause (1994), A Miracle on 34th Street (1994), Eight Crazy Nights (2002), A Charlie Brown Christmas (1965), Home Alone (1990), National Lampoons Christmas Vacation (1938) & Love Actually (2003). I am also aiming to watch a few Christmas movies that I haven't watched before - How the Grinch Stole Christmas (2003), It's a Wonderful Life (1946) & Polar Express (2004). I'm going to see Four Holidays this week sometime (if I can find the time). I know it looks cheesy and cliché but it wouldn't be a Christmas movie without a bit of cheese!!! What Christmas movies put you in the Christmas Spirit? Do you do have something you like to do each year in the lead up to Christmas?